When it comes may we, too, die in the arms of Jesus and Mary with Joseph holding our hand. By example we strive to follow St Joseph to our Savior. 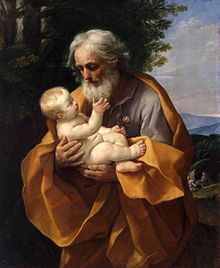 St. Joseph was chosen among all men, to be the protector and guardian of the Virgin Mother of God; the defender and foster-father of the Infant-God, and the only co-operator upon earth, the one confidant of the secret of God in the work of the redemption of mankind. Saint Joseph’s a prime example of what it means to be self-giving and faithful in one’s love. His feast today, is a good opportunity each of us to renew our commitment to the Christian calling God has given each of us. Consider praying on the theological virtues of faith, hope, love: these are the supports of Saint Joseph’s life and of all Christian lives. pray for us, through Christ Our LORD. Amen.